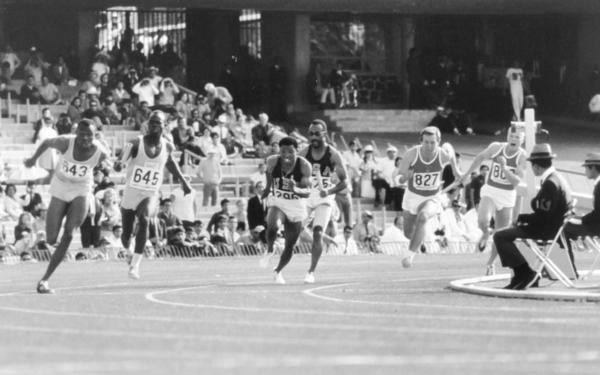 Melvin Pender receives the hand-off in the 4 x 100 meter relay during the 1968 Olympics, for which he won a gold medal. Melvin Pender (right) with his friend, Keith Sims, at their StoryCorps interview in Atlanta last month. Pender had been a platoon leader in Vietnam when he got tapped by the military to compete. At the time, Pender was one of the fastest track athletes in the Army. Before the Olympics, Pender faced mentally and physically taxing challenges while deployed to Mekong Delta in southern Vietnam. "Things happen, you know, you couldn't see the enemy, they were shooting at us from the jungles," he told Sims. He lost one of the soldiers in his division. "This young man died in my arms." After that mission, he says, a captain relayed orders from Washington that he was being pulled from active duty to train for the Mexico City Games. "I didn't want to go. I didn't want to leave my men," Pender recalls. "I told my men, 'I'm going back for you. I'm going to win this gold medal for you guys.' "
When he arrived in Mexico to compete, Avery Brundage, the president of the International Olympic Committee, warned athletes, according to Pender, that if they demonstrated in the Olympics, " 'I'm going to send all you boys home.' "
Pender saw the threats as a sign of disrespect. "How are you going to call someone 'boy'? I mean, here I just got out of combat, seeing people die, you know, defending my country — you're going to call me a boy?" he said. "They don't make boys like me." High-ranking officers issued his fellow African-American soldiers similar warnings. "Col. [Donald] Miller called all us in and said, 'You know, you're in the military. You know you can't get involved in any kind of demonstration.' "
After sports practices, black athletes would gather to talk about the mounting racial violence and inequality happening in the U.S. In these meetings, athletes discussed how they might protest, Pender recalls. "I said, 'I have been going to the meetings, yes. We all have. We all black,' " Pender says. "Just 'cause I'm in the military don't make me anything different, but I'm not going to do anything that's going to disgrace my family and my military career." Although he supported other black athletes who chose to protest, Pender knew he could not demonstrate if he wanted to keep his military standing. Pender's event was the 4x100-meter relay. "To be on the relay team, it was my time to shine," he said. "I ran my heart out. We end up winning the race at a world-record time of 38.2 seconds." And with it, a gold medal. Meanwhile, Carlos, his Olympic Village roommate, won the bronze medal in the 200-meter dash. Smith won gold. The moment is captured in a famous picture: On the medal podium during the national anthem, Smith and Carlos, heads bowed and wearing black gloves, raised their arms with clenched fists in a Black Power salute. Peter Norman, a white Australian runner who won silver, wore an Olympic Project for Human Rights badge in support. Pender tells Sims that he felt proud of his U.S. teammates. "When Carlos came back to the room, I could see the hurt in his eyes, and he just said, 'I did what I had to do, Mel.' And that's when I told him, I said, 'I'm so proud of you.' "
In response to the protest, the International Olympic Committee stripped Carlos and Smith of their gold medals. Much of the media coverage and the international community misconstrued the political statement as unpatriotic, Pender says. "They was not trying to disgrace the national anthem of America," he says. "What was happening was wrong. They were trying to show the world: 'Hey, we are human beings — we're human.' "
After returning to Vietnam, Pender earned a bronze star for his service. He and Carlos remain friends today. All right. It is time now for StoryCorps. Today is the 50th anniversary of the opening ceremonies of the 1968 Mexico City Olympics. A lot of records were shattered at those games. But it was the Black Power salute on the podium by Tommie Smith and John Carlos that got all the headlines. Carlos's roommate at those games was a 31-year-old runner named Melvin Pender. He was a platoon leader in Vietnam when he got the call to compete. 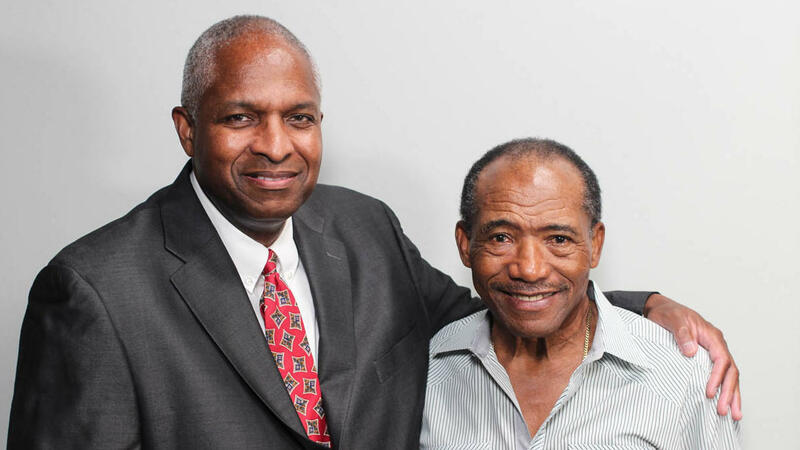 And recently, he came to StoryCorps with his friend Keith Sims to talk about that moment. MELVIN PENDER: I went to Vietnam with the 9th Division straight to Mekong Delta. And things happened. You know, you couldn't see the enemy. They were shooting at us from the jungles. And I had one of my cadets killed. This young man died in my arms. And when I came in that day off that mission, this captain - he said I was going home. And I didn't want to go. I didn't want to leave my men. He said, it's an order from Washington. You have to go back, and you're going back to train for the Olympics. And I told my men - I said, I'm going back for you. I'm going to win this gold medal for you guys. When we got to Mexico, we started getting threats from the president of the Olympic Committee, saying if we demonstrated in the Olympics, I'm going to send all you boys home. How are you going to - how are you going to call somebody a boy? I mean, here I just got out of combat, seeing people die, you know defending my country. You going to call me a boy? They don't make boys like me. Col. Miller called all us in and said, you know, you in the military. You know you can't get involved in any kind of demonstration. I said, I've been going to the meetings, yes. I said, we all have. We all black. Just 'cause I'm in the military don't make me any different. But I'm not going to do anything that's going to disgrace my family and my military career. To be on the relay team, it was my time to shine. I ran my heart out. We ended up winning the race at a world record time at 38.2 seconds. KEITH SIMS: A gold medal. SIMS: Now, John Carlos was your roommate. SIMS: ...When you saw that? PENDER: Proud. You know, when Carlos came back to the room, I could see the hurt in his eyes. And he just said I did what I had to do, Mel. And that's when I told him - I said, I'm so proud of you. They was not trying to disgrace the national anthem of America. What was happening was wrong. They were trying to show the world, hey, we are human beings. We are human. That changed my life. KING: That was retired Capt. Melvin Pender. He won a gold medal in the 4x100 meter relay in the '68 Olympics. And right after Mexico City, he was sent back to Vietnam, where he earned a Bronze Star. He and John Carlos are still friends today. And this interview will be archived, along with hundreds of thousands of others, at the Library of Congress. Transcript provided by NPR, Copyright NPR.